Composite linear items are created by joining simple linear items together: roads are formed by joining road sections, metro lines — metro line sections, rivers — riverbed sections, etc. You can edit these items by changing their contents (i.e. 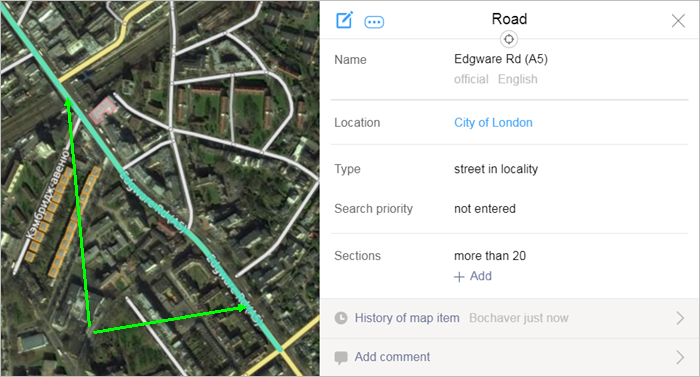 adding or excluding sections) or changing the item's attributes (such as by renaming a street). Create a line section (see 2.6.1.1. Drawing simple linear items) as part of a line For example, a section of road is part of a larger road. Enter a value for the Part attribute, which assigns the section to a specific line (for example, a road or metro line). All attribute panels for composite line sections (i.e. sections of roads, sections of metro lines, sections of rapid transit lines, etc.) include this attribute. If there are no lines on the map, this field is filled in manually (a new line is created). If the line was created earlier, then you can choose a name from the list. The name of the line displays in the panel as a link that opens the entire line attribute panel. Add or exclude sections of the item. 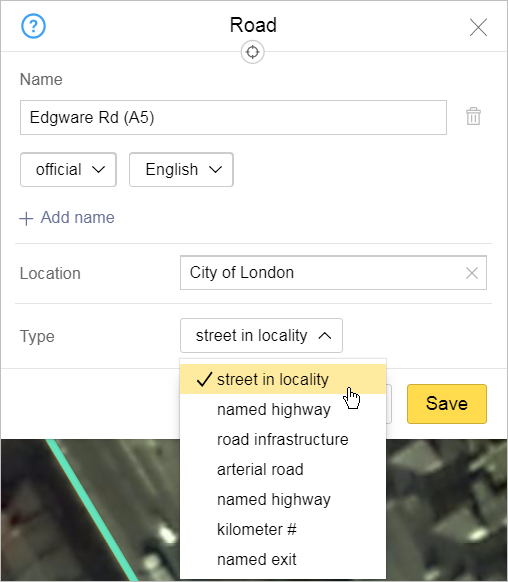 Change attribute values (for example, by changing a street name or the administrative entity that controls a section of a railway). 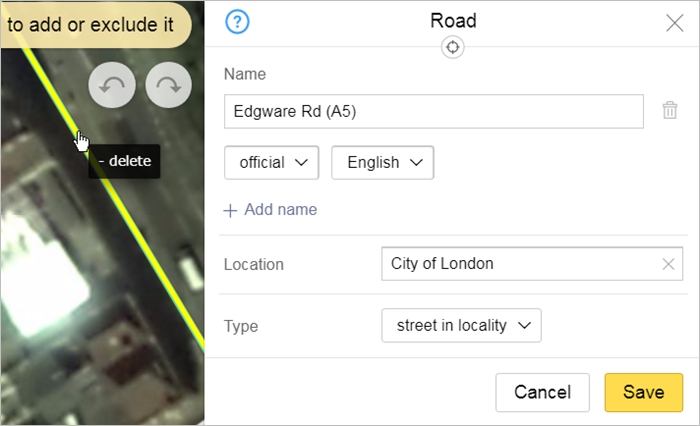 Select the section of the item you want to edit, such as a section of road (motorway, railway, etc.). When you select it on the map, the section and the composite item that it's part of all get selected. Click Edit on the panel (or press Ctrl + E). The item and attribute panel switch to editing mode (where you can edit the item's components and attribute values). To exclude sections of an item, click on that section of the line. To include sections (that are not currently part of the item): click on that section of the line. Names of lines are edited in much the same way names of other items on Yandex Map Editor are. Enter the type of line by selecting a value from the drop-down list. Location: enter the name of the appropriate administrative division in the field. 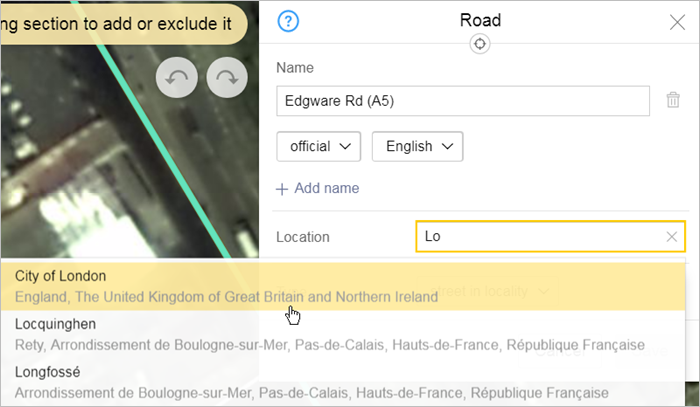 When you edit motorways, you can add sections of road as a group. Use this function to add several road sections that form a connected line to an existing road. Select a section of road that is already part of the road you are adding additional sections to. Go to the attribute panel for that road. Click (Edit) In the attribute panel. Click (Add group of sections) in the local toolbar. 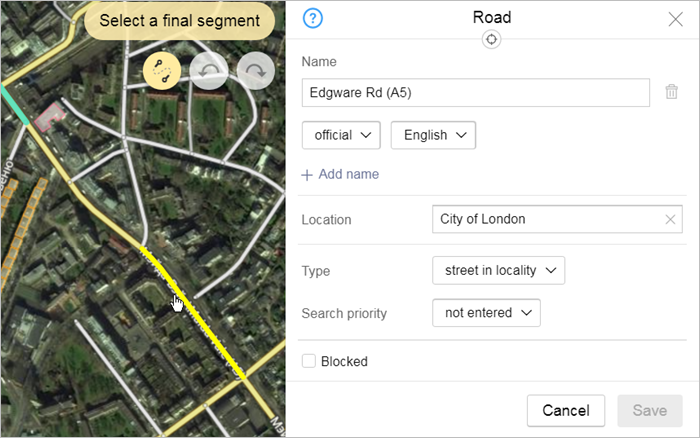 The sections of road that link the beginning and ending sections will be selected automatically.